In series of banking study material toady am sharing very important and famous monthly magazine of ARIHANT BANKING GURU November Issue, which is must for an ideal preparation of any competitive exam. 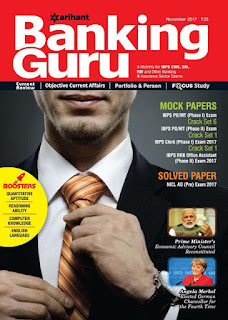 The magazine mainly covers monthly current affairs covering each field of technology, National and International happenings around the world,sports news etc with lot of other stuff related to quantitative section, previous solved papers, Interviews of successful candidates from various exams and much more. Therefore I request all my reader who are preparing for their upcoming exams and needs extra knowledge to boost their mind and mental skills. The link is working perfectly and file will open google drive fromm where you can download it for further study and sharing.